The Invasion of Kuwait, also known as the Iraq-Kuwait War, was a major conflict between the Republic of Iraq and the State of Kuwait which resulted in the seven-month long Iraqi occupation of Kuwait which subsequently led to direct military intervention by United States-led forces in the Persian Gulf War. 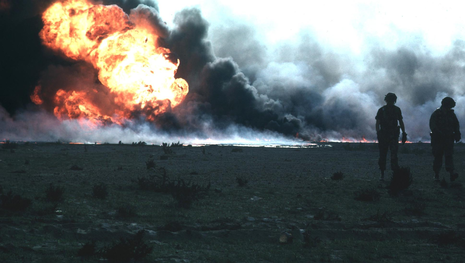 In 1990 Iraq accused Kuwait of stealing Iraq's oil through slant drilling, but some Iraqi sources indicate Saddam Hussein’s decision to attack Kuwait was made only a few months before the actual invasion suggesting that the regime was under feelings of severe time pressure. The invasion started on August 2, 1990, and within two days of intense combat, most of the Kuwaiti Armed Forces were either overrun by the Iraqi Republican Guard or escaped to neighboring Saudi Arabia and Bahrain. The state of Kuwait was abolished, Saddam announced in a few days that it was the 19th province of Iraq. On August 2, 1990 at 0200 hours, Iraq launched an invasion with four elite Iraqi Republican Guard divisions (1st Hammurabi Armoured Division, 2nd al-Medinah al-Munawera Armoured Division, 3rd Tawalkalna ala-Allah Mechanized Infantry Division and 6th Nebuchadnezzar Motorized Infantry Division) and Iraqi Army special forces units equivalent to a full division. The main thrust was conducted by the commandos deployed by helicopters and boats to attack Kuwait City, while the other divisions seized the airports and two airbases. In support of these units, the Iraqi Army deployed a squadron of Mil Mi-25 helicopter gunships, several units of Mi-8 and Mi-17 transport helicopters, as well as a squadron of Bell 412 helicopters. The foremost mission of the helicopter units was to transport and support Iraqi commandos into Kuwait City, and subsequently to support the advance of ground troops. The Iraqi Air Force (IrAF) had at least two squadrons of Sukhoi Su-22, one of Su-25, one of Mirage F1 and two of MiG-23 fighter-bombers. The main task of the IrAF was to establish air superiority through limited counter-air strikes against two main air bases, to provide close air support and reconnaissance as necessary. In spite of months of Iraqi sabre-rattling, Kuwait did not have its forces on alert and was caught unaware. The first indication of the Iraqi ground advance was from a radar-equipped aerostat that detected an Iraqi armour column moving south. Kuwaiti air, ground, and naval forces resisted, but were vastly outnumbered. In central Kuwait, the 35th Armored Brigade deployed approximately a battalion of tanks against the Iraqis and fought delaying actions near Jahra, west of Kuwait City. In the south, the 15th Armoured Brigade moved immediately to evacuate its forces to Saudi Arabia. Of the small Kuwaiti Navy, two missile boats were able to evade capture or destruction, one of the craft sinking three Iraqi vessels before fleeing. Kuwait Air Force aircraft were scrambled, but approximately 20% were lost or captured. An air battle with the Iraqi helicopter airborne forces was fought over Kuwait City, inflicting heavy losses on the Iraqi elite troops, and a few combat sorties were flown against Iraqi ground forces. The remaining 80% were then evacuated to Saudi Arabia and Bahrain, some aircraft even taking off of the highways adjacent to the bases as the runways were overrun. 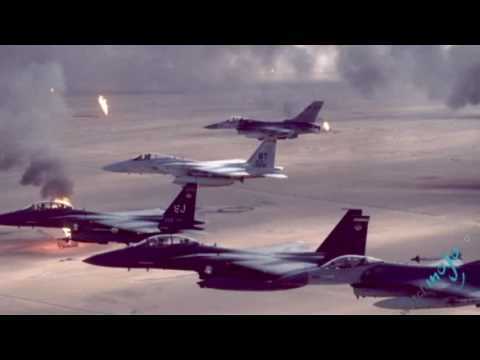 While these aircraft were not used in support of the subsequent Gulf War, the "Free Kuwait Air Force" assisted Saudi Arabia in patrolling the southern border with Yemen, which was considered a threat by the Saudis because of Yemen-Iraq ties. Iraqi tanks attacked Dasman Palace, the royal residence. Amir Jaber Al-Ahmad Al-Jaber Al-Sabah had already fled into the Saudi desert, but his private guard and his younger half brother, Sheikh Fahad Al-Ahmed Al-Jaber Al-Sabah, stayed behind to defend their home. The Sheikh was shot and killed and his body was placed in front of a tank and run over.